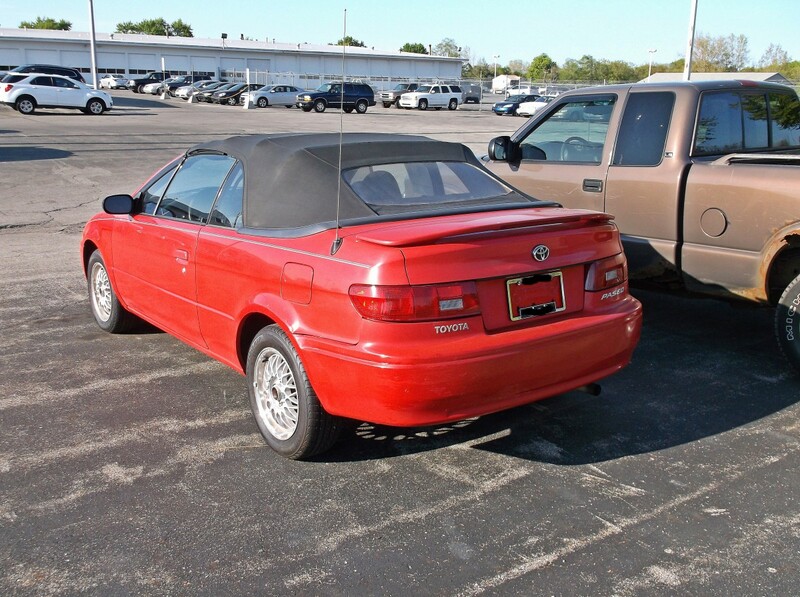 If you crave a comprehensive history about the 1997 Toyota Paseo Convertible, keep on walking, because this is among the last cars I’d be willing to buy, drive, or otherwise be seen in. I’m also not all that keen on researching every last detail regarding its genesis and eventual execution. It is, however, a somewhat nonconforming addition to the local used car lot, which is reason enough to give it a quick once over. From what I’ve hastily gathered in a high school English student method of research (aka Googling it and going with the first couple of websites I could find, regardless of their potential for accuracy), the 1997 Paseo was the only year the convertible was offered, and only 1000 were made, all by ASC in California. You see, the Paseo, even the standard version, is a car that has almost totally escaped my memory, like that just big enough one-hit wonder that brings all those memories flooding back because nobody’s played the song in years. Unfortunately, in the heady days of my youth I was more a 5.0 Mustang guy than a Supra or Celica guy; therefore, this car brings back nothing but a deadpan, quizzical stare as I tried to determine the year of manufacture without looking at the dealer tag. Full disclosure: At first I didn’t even know the make or model, and that doesn’t happen often. I’m not sure I’ve ever seen one before. As it stands, the hangers on at the lot tonight must have wondered why a middle-aged man wearing a Schwinn Bicycles t-shirt and driving a ’53 Buick was taking pictures of this nineties oddity. Having graduated in 1995, one would think that this was right up my alley, but I was already lost in a world of stuff older than I was…and gosh the nineties haven’t aged well. After the eighties, I thought the nineties were tame, but then I looked at the seats of this Paseo. So much for conservative attire. Of course, the nineties only seemed fashionable at the time because it wasn’t the eighties. For some reason, the song “Barbie Girl” by Aqua just popped into my head, and I can’t make it stop. Click this link if you hate yourself. On the plus side, this Paseo is like a Fiesta! Seriously, that driver’s seat is beginning to fray, and where are you going to find that pattern? Anyone? All jokes about taste aside, this car doesn’t seem like that bad a deal. Showing just under 150,000 miles on the odometer, this Toyota probably has years and years to become stylish again. All trends return, just as all waters lead to the ocean if you wait long enough. With under 100 horsepower filtered through an automatic, you can drive slowly while waiting for the inevitable return of splashy teals and faded reds, just as I always wait for my sideburns to return to public favor. This Paseo’s been on the lot for months, even at its $2495 “dealer special” asking price. The pictures make it obvious that it’s been wrecked (just look at the front fender), so lay 15 Benjamins on the hood, and who knows? You could drive away with Will Smith’s “Summertime” blaring from the tape deck, thinking about the old days and how you never remember seeing a car like this. Me? I’ll just walk away. “I want to give a walk, but I do not want to buy this car”. I only started studying Spanish last year so Gerardo would be the better interpreter. Price is still too high, for the miles, at $1500. This is a “chick car”, but today’s young women want an SUV, so this will never sell. Color and transmission are of no interest to a guy so the only potential buyers will be….someone desperate for cheap wheels who can’t find anything else? You never know. There might be some little old man out there who just wants a cheap, easy to maintain and drive convertible for going to church and the grocery store this summer. So it follows that SUVs are “chick cars” too. What about fullsize pickups? The world turned upside down! If we wait long enough, perhaps the chicks will all be driving big stuff and Real Men will react by fighting over this Paseo. The Paseo often slips my mind too, as I never saw many of these even as a kid in the 1990s. I had no idea that only 1000 convertibles were made though, as I feel like I’ve actually seen a handful on the roads the past few years, in different colors too. 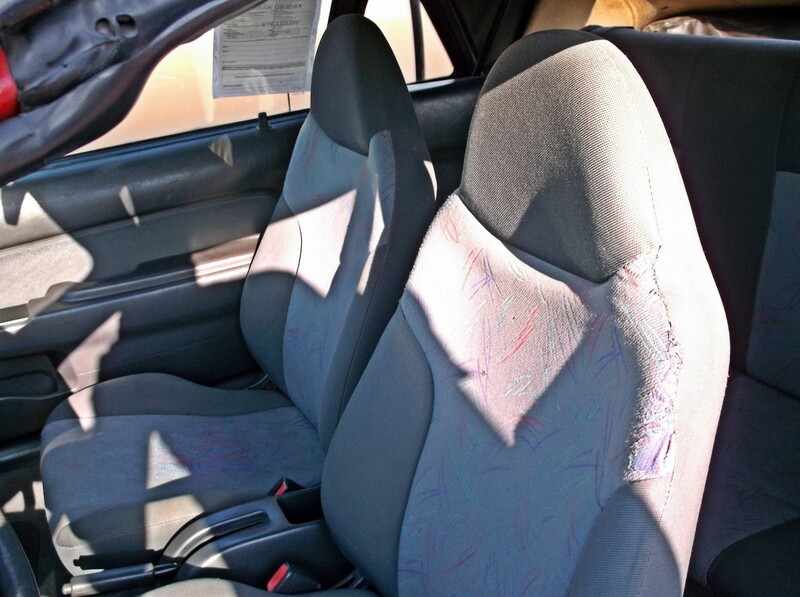 On the note of taste, I actually do miss the color splatter upholsteries of the 1990s. A fun and interesting way to break up the mass of gray, even if the fabric wasn’t that high-grade. For whatever reasons these color splatter patterns remind me of the neon lighting used on the entrance signs to local area malls in the mid-1990s. My first car, a ’96 Holden (Opel) Astra had a grey interior but there was nice contrast of light gray and dark gray trim pieces with an upholstery, on the doors too, that was gray with subtle blue and red stripes. The nicest gray interior I’ve ever seen. 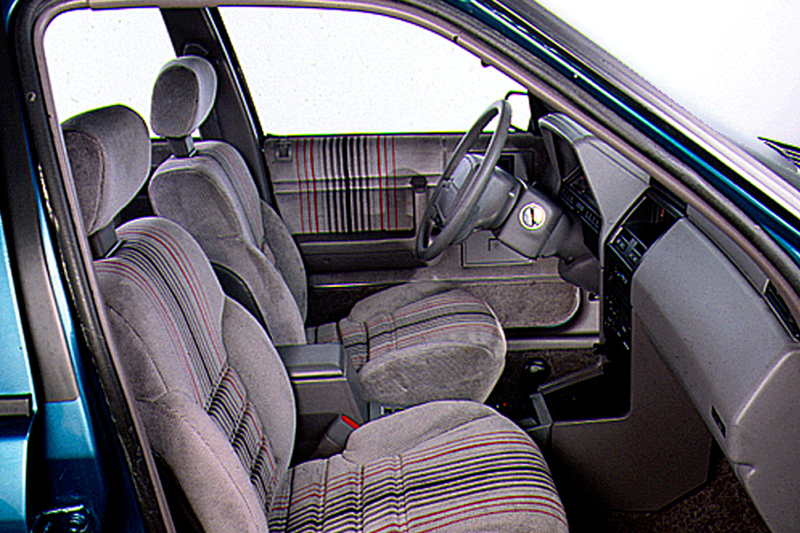 Chrysler had some cool color striped interiors of the early 1990s, like this Plymouth Sundance RS. The same upholstery and very comfy looking seats were also available on early 1990s Caravans, though I’ve never seen the red and blue stripes in a Voyager. My son’s ’01 Lancer has some wonderful blue-and-red splatter on grey upholstery. In our ’00 Diamante it’s a more conservative beige-and-ivory on cream – actually very tasteful. At the risk of sounding very cynical, one advantage of the color-spatter thing is that it helps to reduce the sting when your first new car acquires its first upholstery stain — which, for a car pitched to first-time new car buyers who frequent drive-through fast food restaurants, seems like a worthwhile feature. Aaron, like you, I couldn’t care less about this car and for many of the same reasons. However, this was a delight to read. Thank you. This was about how I thought of all cars from the 70s about 20 years out from their appearance (and from my high school graduation.) It has only been in the last 10 years or so that I have come to a grudging appreciation of 70s stuff. So give this another 20 years and you might come to like this one too. “the nineties only seemed fashionable at the time because it wasn’t the eighties.” – the best description of the 90s I have read. And they seemed so nice at the time. 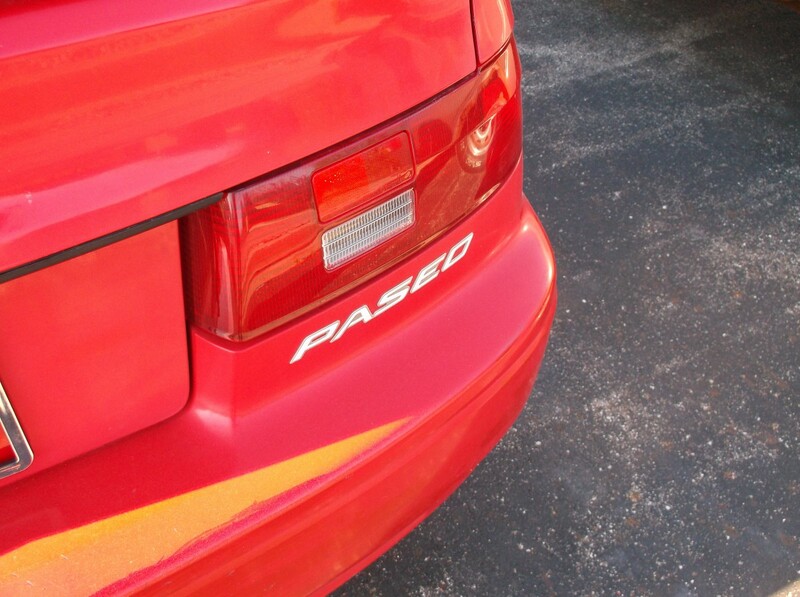 I remember when Toyota first introduced the Paseo coupe. I wasn’t impressed with the car. I preferred its predecessor, the Corolla GT. I wasn’t impressed either. Who wanted a bland, small coupe? We were all buying hatches. I may be in the minority, but I like the Paseo, without having driven one. I’d probably hate the automatic (as I hate pretty much anything with an auto and 4 cylinder), but back in the late 90’s when I had a ridiculous commute I actually briefly looked for a used Paseo Convertible as a commuter car. I thought it might serve as a little bit of fun while still being reliable and economical. I was driving a ’96 Sentra at the time, so the Paseo looked like a reasonable replacement. I’m surprised to learn there were so few made, as like Brendan stated above, I recall seeing a few back in the day in the Northeast. At this stage it wouldn’t be of interest, but if I had a teenager to put on wheels I might be inclined to make an offer. It’s slow, easy to handle, good on gas and has Toyota reliability going for it, so it wouldn’t necessarily be the worst option as a first car. I doubt I’d be inclined to pay more than $2k for one, but considering that my neighbor just paid $3k for a 2000 Civic with 160k on the clock, I suppose the asking price is in the ballpark of what (not-so-savvy) consumers seem willing to pay. In the 1960s when I was in college, the small convertibles of the time were very attractive to me. 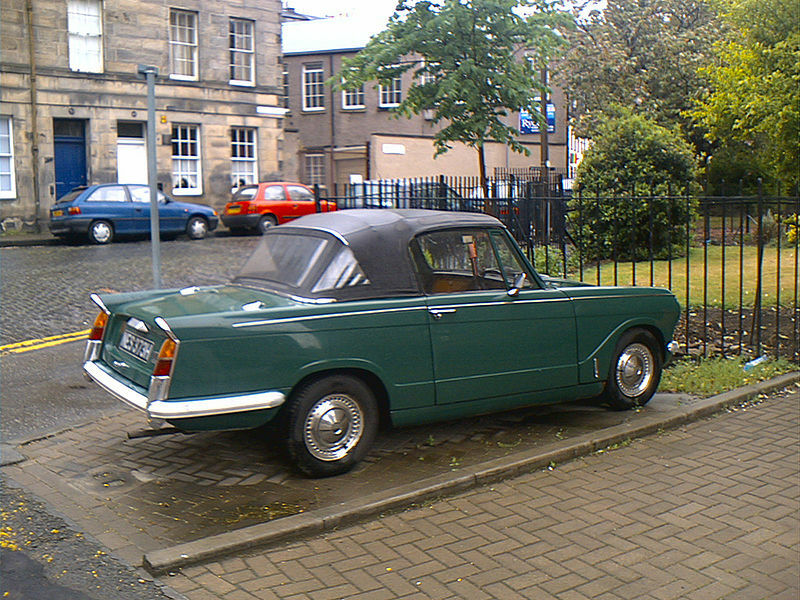 These included the Triumph Herald, the Karmann Ghia, the Beetle convertible, and the Lark convertible. I would still like to have one of these today. So why is the Paseo, probably as or more reliable than these desirable antiques and safer to boot, of no interest? People are odd that way. Me included. I’ve thought about this quite a bit. Any new car is infinitely more reliable than an older one ever was. But that Herald, even from the factory, would squeak and rattle. It would probably leak oil. It would idle roughly when cold and the driver would be uncomfortable from drafts. Winds would blow it all over the road. But all of these imperfections personify it, make it human; therefore, we can connect with it. We become one with the machine. A Paseo doesn’t quite have the same effect. My reaction exactly. This car is really very much the modern equivalent of, if not a Herald or a Karmann Ghia, certainly an early Falcon or Chevy II convertible. If this piece were on one of those, there’d be a lot of positive response to the gist of, “I really like these old compact convertibles, I wish they still made cars like this.” I guess it’s just not old enough to invite the same nostalgia. Probably too reliable as well. If I was looking for a little weekend convertible bomber, this would do. Say what you will about the brash upholstery, at least this Paseo comes from an era when cars were available in actual colors! Speaking of the nineties….. the other day, I just popped ‘Office Space ‘ into the DVD player for the first time in years. One of the things I noticed immediately, was how much more colorful cars were back then. Lots of forest greens, blues, nineties teal (which I dearly miss…), and of course bright red cars like the Paseo. It’s depressing to see just how somber the color pallette has become in the last fifteen years. Of course the world is a far less sunny and optimistic place then it was in the nineties, but that’s a topic for another blog. Office Space is such a great movie. The cars are colorful until you count Michael Bolton’s and Peter’s cars; weren’t they silver and beige? It’s funny to think about how much has changed as far as public perception of happiness is concerned. The late ’90s were good times for a lot of people, but it was surely short lived. Car lots are a sea of bland because the dealers want them that way. It’s far easier to sell a colorless car than a colored one, since there’s always a likelihood that some percentage of your buyers don’t like a given color, but almost anybody can be sold a car painted beige or shade of grey. Have automotive dealers changed so much in twenty years? It seems that if your argument is true today, it would have been true in 1995 as well. What you say is true, but the used car world is a barren place to those of us who like our cars in colour. We had to do a 400km round trip to get a yellow Jazz for my daughter (like in the TV ads when they debuted here). All the ones for sale closer to home were boring black, white, or silver or an insipid blue. I’d say they were geriatric colours, but I wouldn’t be seen driving them either. Almost anybody except someone who wants a car in an actual color. But those few determined souls, sadly, don’t stack up to those who want something in black or silver to ensure Top Resale Dollar when it’s traded in. And with so few colors to choose from, it’s often all the same. Is a inoffensive metallic ice blue really that much more desirable than silver? So it’s not all dealers’ fault when the carmakers can’t even be bothered to produce the cars in exciting colors. As I hurtle towards the “little old man” demographic, I like the Paseo now, and I did 20+years ago. I just don’t like the looks of the convertible – no wonder this model only was available one year. Because of the soft top, I think this car will be scrapyard fodder sooner than later. Were it still a coupe, I’d admire it, and it probably would’ve sold by now. I miss the late 1980’s to late 1990’s car colors. The buy here pay here lot I have bought cars from has a nice 1993 teal Chevy Cheyenne pick up that they use for running errands and other things (moving stuff of hauling stuff). I have always liked that color and I remember when GM offered that teal color for most of their car and truck lines during those years. Some taillamps, too. Compare this Paseo’s to those of an ’05 US/Canada Accord. I was just thinking that about the tail lights. Count me as a fan of the Paseo/Cynos (JDM name) family. I always found the styling to be quite attractive for what is essentially a rebodied Tercel. Interestingly enough, the first series Cynos in Japan could me made considerably sportier than what was on offer here with things like the 110ps 5E-FHE and TEMS electronically modulated suspension. Sadly, these were done away with the release of the second series. These Paseo/Cynos convertibles were not only sold in North America, but also in Europe and Japan thru 1999. A grand total of 3,869 were produced. Toyota themselves added structural braces in the rocker panels, rear strut towers, and rear fenders at the Takaoka plant in Japan before sending the partially assembled coupes to ASC for conversion. All told, the convertible only adds 143 pounds to the weight of a coupe. One odd fact in regards to the convertible is that the rear side glass is affixed to the manual top mechanism itself; one cannot lower these windows with the roof in place, nor can you have them up when the top is folded back. 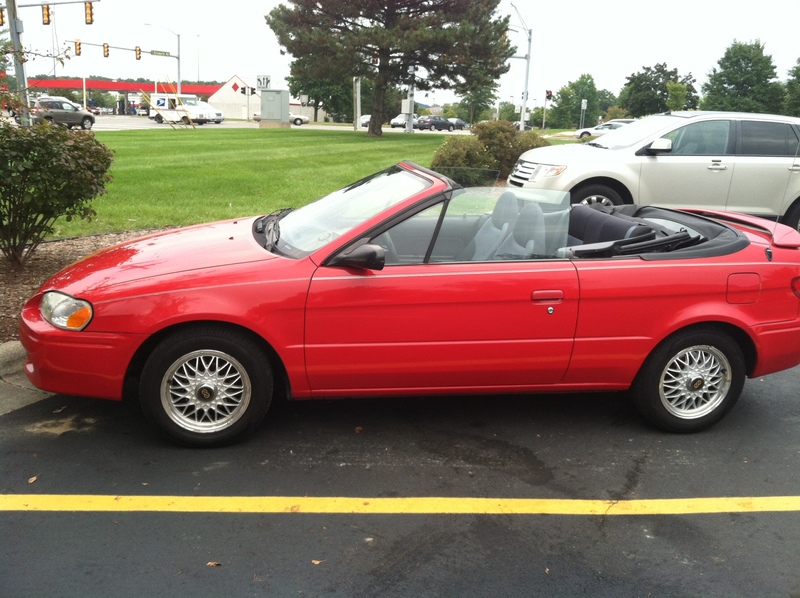 This Paseo convertible was the most affordable drop top one could buy in the USA in 1997. Thanks to Aaron and yourself for helping tell the story of what is a pretty obscure car. It probably says something that I can’t remember whether the second generation like this was sold in Australia, and I’m not going to look it up, but it is still good to learn something new. 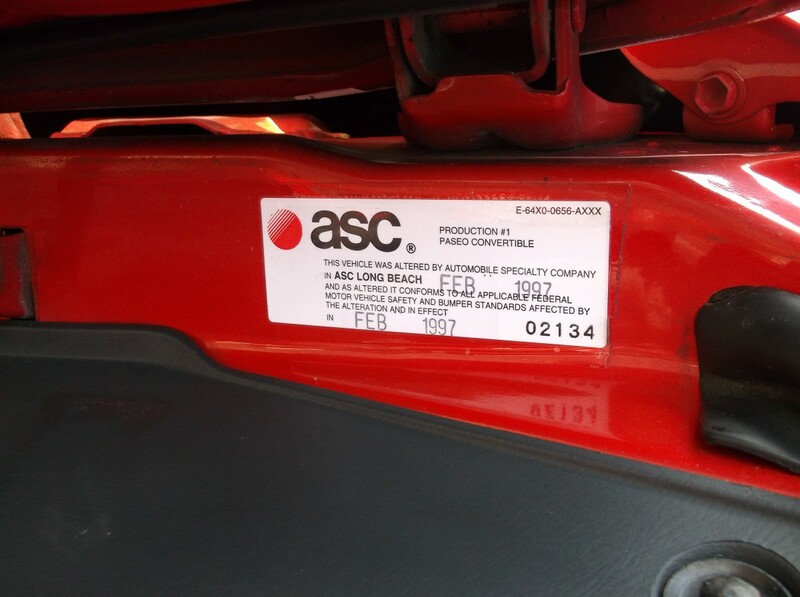 ASC had a long interesting history and played a part in a lot of forgotten CCs including the mitsu 3000gt convertible, solara, dakota pickup, etc. If it were dark blue and had a stick I might consider it. Peel off the Paseo sticker and badge it Tercel to mess with minds. For a ’90s econobox ragtop it’s much better looking than a Swift/Firefly?Metro disaster. Although those are cool too in the awkward looks department and surprisingly easier to find. This had to be a tough sell for Toyota when Mazda was doing it so much better. +1 Ford and GM got into this at the time too, the later MN-12’s (T-Bird/Cougar) and the catfish Taurus had color flecks and different patterns on the seats and the cloth inserts on the door panels. Even the 97-99 Lesabre Customs had multi-color patterns on the seats. I’m not a big fan of convertibles but I’d rather have that than a Cavalier convertible! 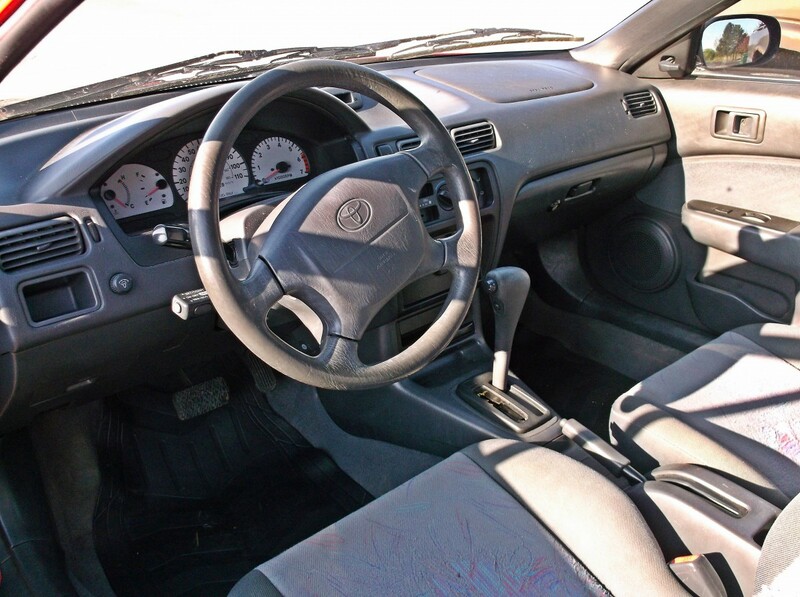 The mid-late 1990s Tercels were quite reliable cars and cheap to own. I have never seen one like that! I guess it wasn’t available here in Canada. 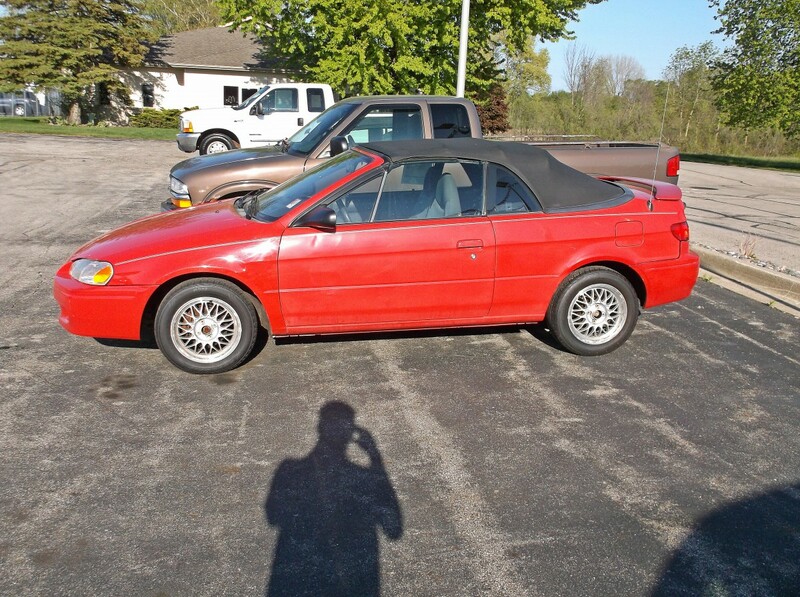 The 1990’s Celica convertible was another car we didn’t get here. BTW, I remember back in the 1990s seeing a, early/mid 1970s Celica convertible on the I-95 with the top down on a cool December day somewhere between Virginia and Georgia. I’m wondering if ASC also converted these? 4) put $500 aside for the inevitable deferred maintenance repairs. it should be good for a few years of relatively trouble-free top down driving before the timing chain or transmission goes. 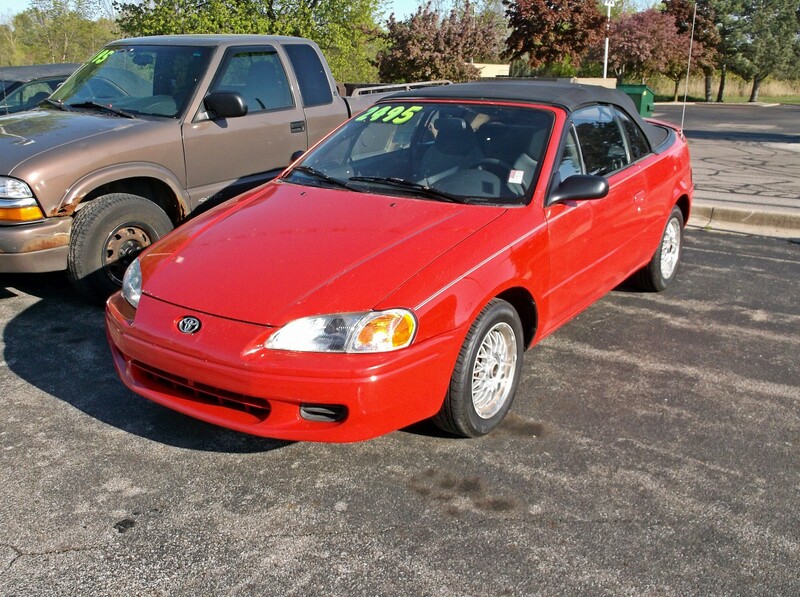 $1500 for a convertible with ’90s era Toyota reliability wouldn’t be too bad. Drive it on pleasant summer evenings for a couple of years, then flog it on CL for $1999 obo. Years ago we retired my wife’s ’97 Paseo rag top to part time beater use. Sits in the garage on a trickle charger most days. As a beater, I adore it. 32 mpg, great AC, I can drop the top and haul big items in it, and I can park it in tight places with ease. The snobbery in this blog’s Paseo bashing write up is typical of an author who thinks graduating in ’95 makes him some kind of silverback, and liking the stamped out dime-a-dozen 5.0 Mustangs makes him cool. My generation drove 7.4 liter muscle cars and laughed our asses off when Ford convinced gen X’ers that 5.0 was a meaningful number. And I love kicking around in our beat up Paseo rag top. What can I say? Real men love Paseo’s? No. But they aren’t afraid of them. Fair enough, Bert. You’re annoyed that I don’t particularly like this Paseo. It’s certainly not because it’s girly; after all, my Corvair convertible is not exactly going to win me any points at a testosterone party. Saying that it wasn’t something I’d want to be seen in was rhetorically tongue-in-cheek. I’m not exactly sure, however, what you’re trying to say about the 5.0 Mustang. I haven’t wanted one of them in almost 20 years (although my dad still has one), and I’m on your side with muscle cars. Other than my daily driver, my newest car is a ’74 model. To disregard the 302 Mustangs of the ’80s as being weak, however, is unfair, as is your assertion that your entire generation laughed at them. They are still one of the more popular drag cars among all ages, even as some people are now plugging LS-motors into them. They were as fast as the majority of ’60s and ’70s muscle cars. It’s not like a 325 horse 396 or even something with an LS5 was any faster, although I’d take something with a BBC almost any day over a Fox-Body Mustang. Anyway, enjoy your Paseo, and who cares what anyone else thinks? Oh man — I was more than a little tipsy when I wrote that. Really. Sorry about that. It reads a bit differently now! I’ll steer off topic for a moment, then swerve right back to the Paseo. Liters? No more big blocks? Huh? My friend and I each had real muscle cars — a ’69 GTO and a ’70 LeMans Sport, both with built 400ci engines cranking out over 400hp. After the new 5.0’s emerged, we joked a lot about re-badging our cars with “6.6” on the side so the 5.0 Mustang kids would not be confused when we passed them up — and yes, we passed them up. Of course I say all this as I sit here and contemplate buying a 2016 700hp Dodge Hellcat that if you told me back in 1979 would be a factory offering today… I would have either called your BS or run out to find the nearest time machine. Sometimes it’s good to be wrong about history! PS– I just showed my wife all this, and she thinks this is funny as hell, and was fascinated to learn her old college car is quite rare. (and worthless) Now she wants me to restore / repaint her Paseo on the cheap — in other words, my new garage project car. I currently own a ’97 Paseo convertible with 97k miles and for what it is, its a fun car tooling around town in the summer. 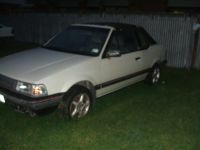 My first car was a Chevette and thorouhly enjoy driving small cars, especially Japanese. When I have the need for speed I just hop on the motorcycle. I’d buy it if it’s still available. I loved this car when I had it.